What’s the difference between an Osteopath, a Physio and a Chiropractor? This is a question we get asked all the time! Unfortunately, people often don’t know what an Osteopath really is, and therefore don’t know when osteopathic treatment could be exactly what they need. 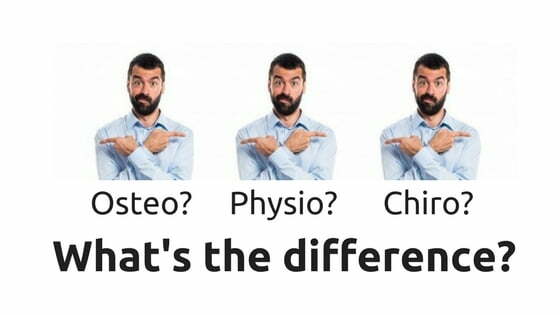 What’s the difference between an Osteopath, a Physiotherapist and a Chiropractor? Firstly, there are many similarities, especially as all three treat conditions affecting the muscles, joints, nerves, ligaments etc – what is known as the Musculoskeletal system. The differences are in the principles behind the approach to treatment. Of course this can be confusing, especially as many people associate Osteopaths only with back pain treatment, so they might not look for an Osteopath when they have a shoulder problem, for example. Secondly the difference is whether the treatment is hands-on or not, and what techniques are used. Physios often prescribe exercise or treatments like ultrasound, or a version of acupuncture, and might not do any hands-on work at all. Chiropractors often have a long series of brief treatments focused mainly on manipulating the spine. Osteopaths usually have longer treatment sessions which include all areas of the body using a variety of hands-on techniques as well as analysis of your posture, exercise habits and lifestyle. Even nutrition is relevant, as it’s all part of your general health. Thirdly, Physiotherapy is mostly within the NHS (although there are private physios) and the other two are mostly outside the NHS (although there is some limited but growing NHS provision). It is true to say that the NHS probably doesn’t fully understand Osteopathy, and the way the NHS describes what we do is not always accurate. (See the NCOR article link at the end of this post). So what IS Osteopathy then? Osteopathy is based on the principle that the body can heal itself and treatment is aimed at facilitating that process. For your body to work well and keep healthy, it needs to be able to move freely because your movements assist your circulation, digestion and all bodily processes. Obviously if you have back pain, or any pain, it will limit how you move. But have you considered that it probably came about because of your movement or posture habits? Or have you thought that pain in one area of your body might be connected to pain or dysfunction elsewhere? For example, are your headaches, wheezing, poor sleep, stiff neck and occasional pins and needles in your right hand all connected? So your Osteopath will ask about your job activities, your hobbies, your typical daily activities and your typical sleep patterns as well as examining your whole posture and breathing and then looking in detail at your neck, both shoulders and upper body. Then treatment is aimed at improving all those areas, so you can sleep better and ease your neck and shoulder tension, which relieves the headache and pins and needles.